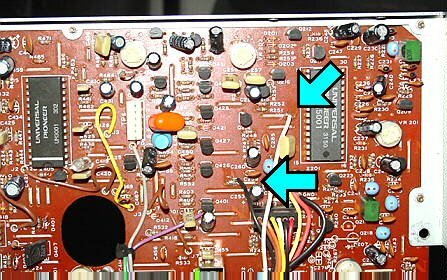 This document will help you transplant parts from a non-working Pioneer PR-8210A into a working PR-8210 player. The operation is fairly simple, and I have done this myself and verified that the modified player works with a Williams Star Rider board set. If you are unsure what any of the terms used in this document refer to or do not understand sections of this document, make sure you find out! Do not attempt anything in this document unless you know what you are doing! The information in this document is believed to be correct, and works fine for the author. I cannot guarantee that this will work for you and I am not responsible for any damage you may cause to your laserdisc players. A non-working Pioneer PR-8210A player. The problem with the player must be that it will not spin up or play. If the player does play but does not work with your Star Rider board set, then it is not a good candidate for transplanting and may still not work once the operation is completed. In that case you may want to verify that the cause of the problem is not the board set or the connection from the board set to the player. A good resource for asking questions about Star Rider is the Dragon's Lair Project message board. A soldering gun / pen, some solder, a small flat-head screwdriver, a Phillips screwdriver and some patience. 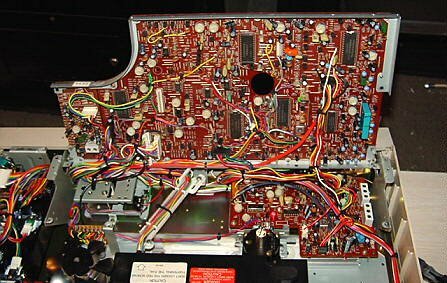 After removing parts from your PR-8210A player, it may not be possible to go backwards and put the player back together properly. The reason for this is we will be cutting and removing the power cord from the PR-8210A player, which could prove very difficult to reattach if you change your mind. It will be necessary to turn the players upside down several times during this operation. When turning the player upside down, do so from front to back and not from side to side. (The player should never be up on its side). It could cause the laser assembly to slide downwards due to gravity, possibly causing damage to a player. 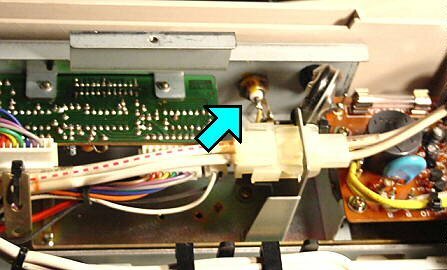 The PR-8210 player is missing one hole in it's inside metal casing where the wires for the PR-8210A connector need to go. 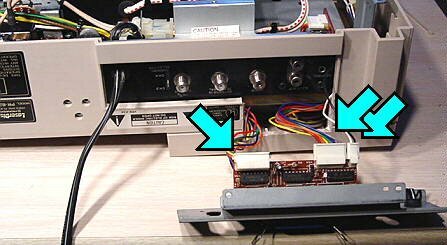 In order to provide room for these wires, it may be necessary to cut a small section of the back of your PR-8210 player above its back connector plate. When finished, your new player will have two back connector plates. The regular PR-8210 back connector plate will provide the video and audio as usual. 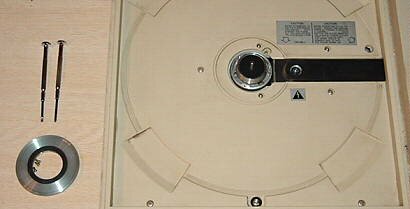 The PR-8210A connector plate will be hanging off of the back of the player and only the Centronics connector on it will be functional. If you want to use your PR-8210 player for multiple games (such as MACH3), you can still use the "remote control" jack on the back of the PR-8210 to control the player. There will be other important notes listed throughout this document. Please make sure you read them carefully and do not proceed unless you understand what they refer to and the possible damage that could be caused by not following them. If you are going to be hooking your Star Rider board set up to a different monitor or test monitor and you need a composite sync signal, you may not be able to tie the h-sync and v-sync directly together from the boardsets monitor output. What will happen if you do this is the player will spin up when you turn the game on, but all of the laserdisc player tests will fail and the game will not start. After I finished doing this PR-8210A / PR-8210 conversion, I was testing the board set and player hooked the board set up to a Commodore monitor. Since the monitor took in composite sync, I just tied together the h-sync and v-sync wires. 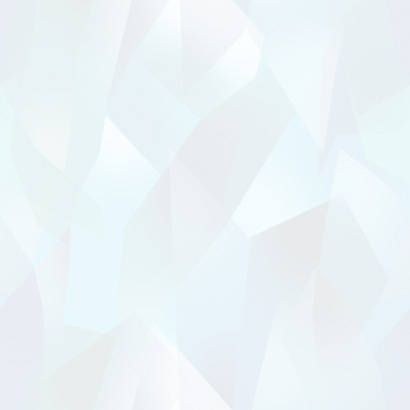 The player would spin up, but the game would not start nor would any player tests work. It appeared as though the game could not find the current frame number. Many weeks later, I was running the board set through the player tests and lifted up the board set to get at something. 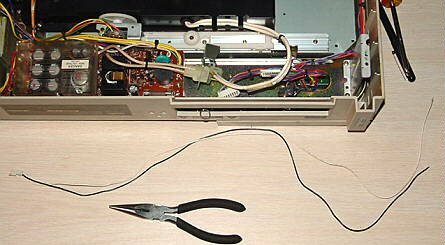 When I lifted it up one of the sync wires accidentally popped off and suddenly the laserdisc player tests all started passing. I verified this problem by hooking the sync wires together and taking them apart, each time watching the player tests fail and then start passing again. 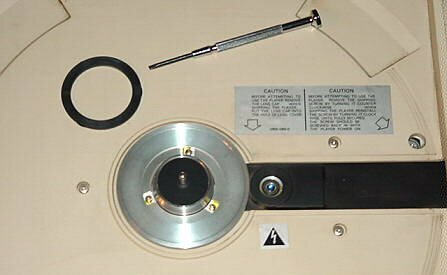 The very first thing we will need to do is remove the hinged cover of the PR-8210A laserdisc player. We do this first because once we remove the power cable we can't turn the player on to open the cover. Turn the PR-8210A on and press the reject button so that the cover "pops" open. Lift the cover up. Unplug the player and turn it around so that you are facing the back of the player. There are two hinges holding the cover on the player. Each of these hinges has three screws. Remove the screws so that you can completely remove the cover from the player. IMPORTANT NOTE: The hinges have fairly powerful springs on them, and will fly up forcefully as soon as the last screw is removed from one. Make sure you are aware of this while removing the hinge screws. Turn the PR-8210A player upside down. Remove all of the screws in the bottom of the player. Lift the bottom cover off of the player. 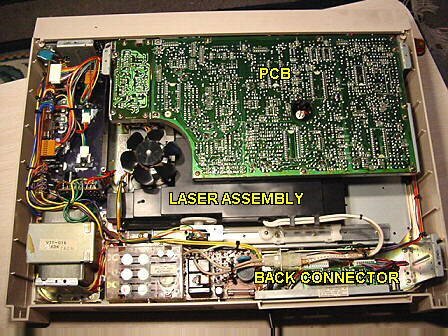 Inside the player, you will see some PCB boards, the laser assembly, the back connector of the player, and some other miscellaneous electronics. Looking at the Centronics connector on the back of the player, you will notice it has a small PCB board and three plugs. Make a note of where the plugs are attached so that you can reconnect them later, and then unplug them. 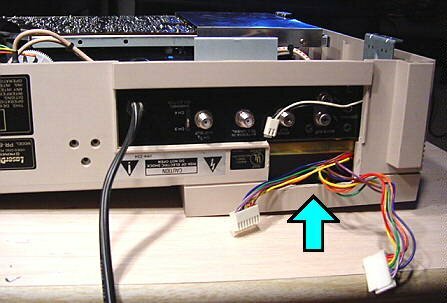 In order to remove the back connector plate from the player, we will need to disconnect the video plug, audio plugs and the power cable. We will not be removing the Centronics connector from the connector plate. You have two choices to remove the audio and video plugs. You can either cut the wires going to these plugs, or you can remove them. The audio plugs can be taken out by removing the screw located in the middle of them. The video plug can be removed by undoing the nut that secures the plug to the connector. My PR-8210A had some rust on the video connector making it difficult to remove, so I just cut the wires from the inside and left the plug where it was. To remove the power cable, cut the cable on the inside of the player. It may be possible to unsolder the power cable if you want to preserve it; however I found applying any heat to the power cable pins caused them to come out of the power board completely. The back connector plate is now ready to come out of the player freely. Undo the two screws that hold the connector plate to the player. Take the connector plate out and place it aside. At this point you can remove the power cable completely by pulling it through the connector plate or by cutting it off. 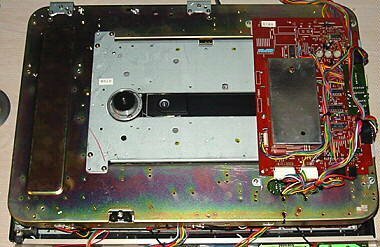 We will need to lift up the large PCB board in the player to remove some of the wiring that the Centronics connector uses. 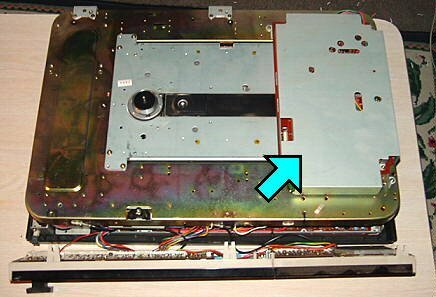 The large PCB pivots at the front of the player and is held down by screws around the edge. Remove all of the screws holding down the large PCB and lift it up. It may be helpful to use something to hold the board up while you work. A long piece of tape works nicely. If you examine the three plugs that were attached to the Centronics connector, two are large and one is small. The small plug should have a black wire and a white wire coming out of it. 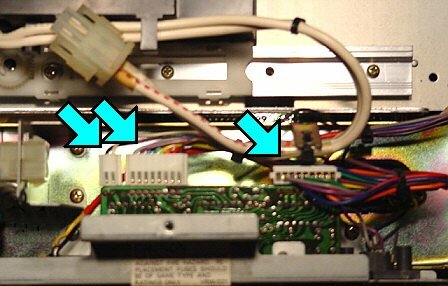 If you follow these two wires through the inside of the player, you will notice that they are soldered to two places on the large PCB that we lifted up. Examine the large PCB board where the wires are connected and write down the location of the wires. It may be helpful to draw yourself a small picture of where the wires are connected. This information is important as we will need to refer to it when reconnecting the wires. The location on the large PCB board where the black and white wires are connected should not have any components at those two locations. They should just be two pieces of metal going through the PCB. Desolder the two wires from the large PCB board. We now want to remove the two wires and small plug from the player. Carefully pull the wires out of the player. You may have to cut a few of the wire-wraps in order to remove them. Do not cut the black and white wire. Once you have removed the small plug and wires, place them aside. This part will require removing the top cover of the player. In my opinion removing the top cover is the most difficult part of this operation. In order to remove the top cover, we will need to remove some screws from inside the player first. If you look inside the player on the extreme right, you will notice a "U" shaped bracket on its side with two screws at the bottom. These screws hold the top cover of the player. Remove the screws. There may also be another bracket on this side that also holds the top cover. There may also be additional screws on this side that hold the front panel to the top of the player. Put the bottom cover back on the player and put a few of the screws back in it. This stops the player from falling to pieces when you take off the top cover. Turn the player right side up again so that it is facing you. The center spindle of the player will have a plastic black ring around it. Pry this ring off using a small screwdriver. You will see three screws under the ring. Remove these screws. Remove all of the other screws you see in the disc section of the player. The top cover is now ready to come off of the player. Start by putting your fingers under the sides of the player and carefully lift the sides to separate the sides from the player. The front panel of the player is also connected to the top cover by plastic tabs. Carefully remove the front panel from the top cover. Now you should be able to completely lift the top cover off of the player. On the right side of the player, you will see a metal cover that covers the "brain" board. Undo the screws on the cover and take it off. IMPORTANT NOTE: Now that the board is exposed, examine the board for three plastic pots on the board. You should take great care not to touch these pots. Even brushing them with your hand can cause them to turn. These pots control how the player finds the start and end of a disc. At the back of the board, you will notice a bunch of wires going through a hole in the metal casing of the player. These wires are for the two large plugs we removed from the Centronics connector. The wires are connected to various places on the board. Carefully pull the wires up through the hole. The board will also have various other plugs attached to it. Write down the locations of these plugs as we will need to reconnect them later. After that, remove all of the plugs. Undo the screws holding the board to the player, remove it, and place it aside. Congratulations! We are now finished working with the PR-8210A. Whatever you do with the player after this is up to you. I recommend saving the player in case you need any parts from it to fix another player. Follow the same preparation instructions as you did for the PR-8210A. We will need to have the disc cover removed before starting. 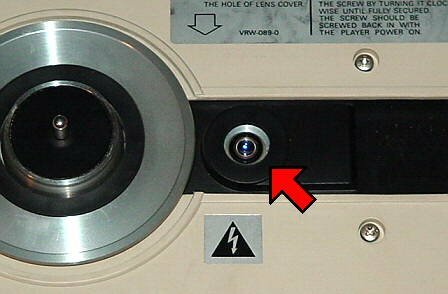 At all times during this section of the operation, take great care that you do not accidentally touch or damage the laser lens on your PR-8210 as it will now be exposed. You do not want to end up with two non-working players. The first thing we will do in adding the PR-8210A connector to the PR-8210 is to put in the small plug that has the black and white wire on it. Turn the PR-8210 player upside down. 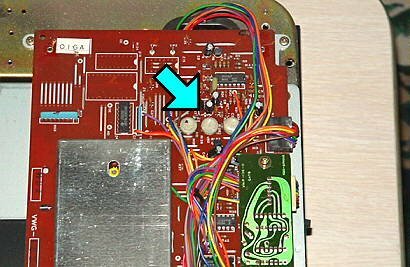 Follow the instruction in Part 2 of working on the PR-8210A to lift up the large PCB inside the player. Next we will solder the black and white wires to the proper locations. 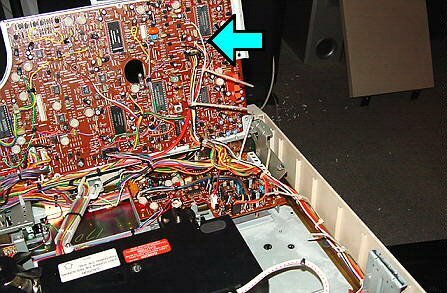 Examine the large PCB and find the proper location for the black wire and white wire of the small plug using the information you recorded before you removed them from the PR-8210A. I found that the pieces of metal where you want to solder these wires do not hold solder very well. In order to make it easier to attach these wires, use a small flat screwdriver and slide it under the metal pieces where we want to attach the wires. GENTLY pry the metal pieces up SLIGHTLY; just enough so that we can wrap the wires around the metal pieces. You may have to strip the wires a little so that you can slide the wire under the metal pieces and then wrap it around them. After you have secured the wires, place a small amount of solder on the wires to make sure they can not slip off. Lay the two wires through the inside of the player so that the plug is coming out of the player. You may want to secure them to wires that already exist in the player using new wire wraps. This will stop them from moving around in the player and getting caught in other internal electronics. 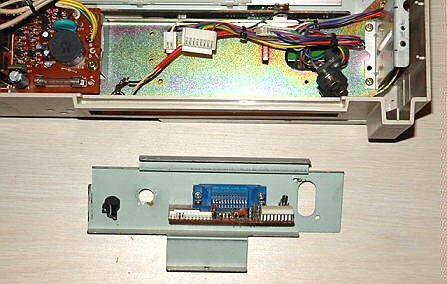 Follow the instructions in Part 3 of working on the PR-8210A to remove the top cover of the PR-8210. Remember to first take out the screws from inside the player that hold the top cover on. When finished, you should have the player right side up with the top cover off. Turn the player so that you are facing the back of it. Remove the metal plate that covers the brain board of the player. As mentioned in the PR-8210A section, take great care not to accidentally touch or move the plastic pots. 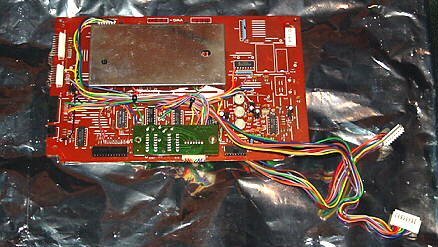 Even though we will be taking out the existing brain board, you never know when you might need it in the future to repair another player. Examine the plugs attached to the brain board and verify that they are the same as what you wrote down when examining the plugs on the brain board for the PR-8210A. 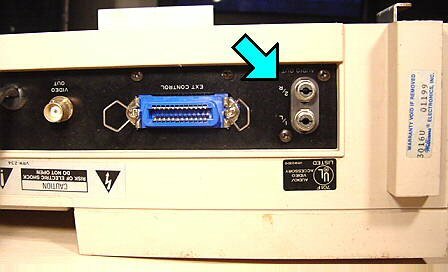 The only difference should be the lack of wires coming off the back of the board for the two larger PR-8210A connector plugs. Remove the plugs from the brain board. Undo the screws on the board and take it out. 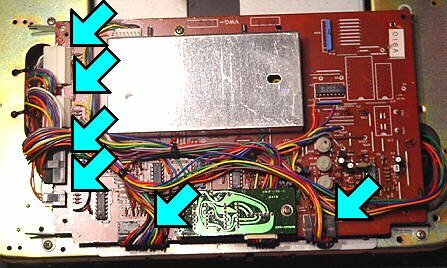 Take the brain board from the PR-8210A and put it in the player. It should be orientated so that the plugs you took off match up. Screw the new brain board in place. Reattach all of the plugs referring to your notes on where these plugs should be attached. Replace the metal cover for the brain board. 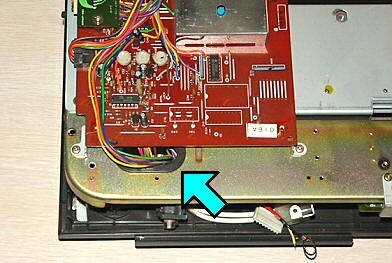 Since there is no hole in the metal casing for the PR-8210, all of the wires for the two PR-8210A connectors will just be hanging off the back of your player. We will now need to put the top cover back on the PR-8210. As mentioned in the important notes section at the beginning of this document, we will need to make some room on the back of the cover for the PR-8210A wires. If we replace the top cover as is, these wires may get badly squished and could even get damaged. Instead, cut out a small section of the cover above the left side of the back connector. The way I did this was to use a drill and make a few holes in the plastic until there was a large enough gap for the wires to fit through comfortably. IMPORTANT NOTE: At this point you have three new plugs coming out of your PR-8210; one small plug and two larger plugs. DO NOT turn on the PR-8210 unless these plugs are attached to the PR-8210A connector. Doing so will cause the player to fast forward as soon as it is turned on and start "banging" the laser assembly once it reaches the end and cannot go any further. 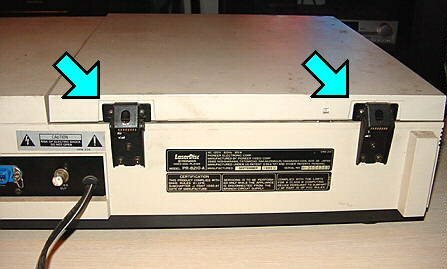 Once you have put the top back on the PR-8210 and attached the plugs to the PR-8210A Centronics connector, try turning the player on and playing a laserdisc to make sure it is operational. You will now be ready to test the player with your Star Rider board set! Thanks to Marcel Gonzalez for submitting the pictures.